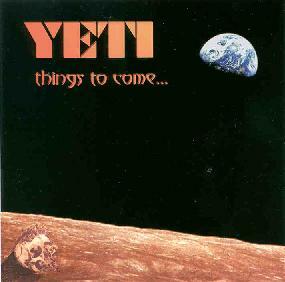 Yeti - "Things To Come..."
Based in Ft. Worth, Texas, Yeti was the product of a merger between two related bands: One was the original Yeti with Tommy Atkins on bass, Jon Teague on drums, and Eric Harris on guitar. A related band was Est Mort which also included Atkins and Teague along with keyboardist Doug Ferguson (Ohm, Muz, Tone Float, Vas Deferens Organization). Eventually Ferguson was brought into to complete the lineup that appears on this CD. In the most simplistic of terms I'd describe Yeti as being like Magma and Univers Zero dosed up and sent into space. Right from the first track, "Two Finger", the music is dark and thundering with a heart thumping bass, wailing guitar, and enough classic synth sounds to satisfy the most nostalgic of progressive fans. But there's nothing retro about Yeti's music. The influences are really all over the place and the music is developed such that each of the CD's four tracks (9 - 16 minutes) is nothing less than edge-of-your-seat gripping. "Interstellar Biplane" is an intensely frantic tune with all musicians ripping up their instruments amidst the most controlled of chaos. The Magma influences are strong here though the keyboards give the music a distinctly Yeti stamp. There are lots of tempo changes and each segment is well structured and thought out. Heavy and complex, though accessible, and certainly majestic in its execution. "Go Like This" is jazzy at the beginning, but soon develops an avant classical symphonic feel. The atmosphere is eerie with the keyboards setting the mood and drumming up images of more horror movies than I could list. The intensity builds to mercury bursting levels, and though the band returns somewhat to the Magma sound on the previous tracks the freakout factor is hight and mighty. "Est Mort" starts as a creepy funeral keyboard bit, but the full band quickly kicks in to create a darkly symphonic piece that's quite powerful and even has a theatrical feel. Ferguson pulls out all the stops with his arsenal of keyboards and seems to dominate much of the music, though the guitar and potent rhythm section are integral to the whole of the piece. In fact, Harris takes the spotlight at one point to kick out some trippy, slightly bluesy, psych licks which sound all the better accompanied by Ferguson's keyboards. In summary, fans of all things Zeuhl, RIO á la Univers Zero, and the heavy complex intensity of King Crimson will drool over this disc. And like Ohm, the varied classic keyboard sounds alone are worth the price of admission. HIGHEST recommendation. Things To Come is distributed by Two Ohm Hop. You can visit Yeti at their web site. You can sample Yeti's music at their Mp3.com web site.